Appliance Repair Service - Proudly Serving East Bay San Francisco for over 20 years! - WEPCO Services, Inc.
Don't Waste Money Replacing; Let Us Repair Your Appliances! At WEPCO Appliance Professionals, we specialize in repairing residential and commercial appliances. Our goal is to help the people of the San Francisco Bay area, including Pleasant Hill, Concord, Danville, Walnut Creek, and West San Francisco, save money and resources by repairing appliances instead of replacing them. Welcome to Wepco Appliance Professionals, a full-service major appliance repair service company, providing service to Concord, Pleasant Hill, Walnut Creek and Danville counties. 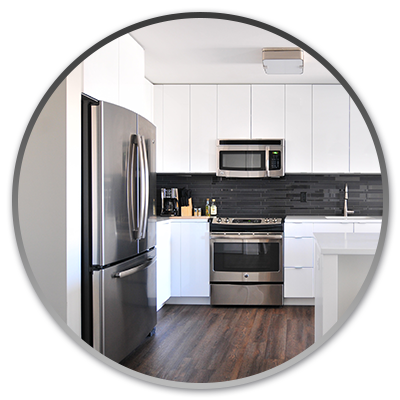 We perform appliance repair services on any of your major appliances including, but not limited to: oven and stove, washing machine, dryer, dishwasher, trash compactors, refrigerators, garbage disposals, ice machines, cooktops and microwaves. We can service all major appliance brands and help prevent you from buying brand new appliances! Before you look at replacing your appliances, give us a call! Cost of replacing vs. cost of appliance repair. As technology advances, so does the appliances available. However, as the technology advances, so does the cost of new appliances. If your appliance is more than 10 years old and malfunctioning, it may be worth it to look into replacing it; however, if your appliance is less than five years old, it is likely that you will save a considerable amount of money by repairing your appliance rather than replacing it. All too often, people will learn to tolerate the idiosyncrasies of their appliances rather than go through the hassle of figuring out what is wrong and making the necessary adjustments. However, if you are being inconvenienced everytime you need to do laundry by having dry your clothes on multiple dryer cycles or you’ve given up and found yourself line drying items to avoid the dryer, you have a useless appliance and your frustration may build with each load. Make your life easier and more comfortable, not to mention get your money’s worth from your appliance, by calling an appliance repair company near you to get it diagnosed and fixed. It is often a much smaller, cheaper issue than you may expect! Abandoned or discarded appliances sit in landfills for decades, which is harmful to the environment. When you call an appliance repair service company, you do your part to extend the life of your appliances and keep them from adding to the problem. When you have your appliances repaired, often times it also helps the appliance to be more energy efficient, which will help your home consume less energy. If you’ve decided it’s time to hire an appliance repair company in San Francisco’s East Bay Area, contact us at Wepco Services, Inc. When you do a search for appliance repair service companies near you, you’ll find more than a few options. Take the time to read some reviews that previous customers have left. If the site does not have a testimonials page, you can search for them in a BBB search or check out local review sites such as Angie’s List. If any of your neighbors or friends have used a service, ask them what they thought about the quality of services, the demeanor of the repairman and the cost of service. Check out the appliance repair services they offer. Many large appliance stores offer appliance repair services for relatively low prices because they make their money off of selling new products rather than repairing existing appliances. Exclusive appliance repair companies are in the business of making your existing appliances last longer and don’t have replacement machines to sell you. Look for repair companies that offer multiple services to check out all your appliance problems in a single visit, rather than hiring a different company for each appliance. When you contact an appliance repair company, ask if they can diagnose the issue based on the symptoms you describe or if they can offer an estimate of time and cost to repair the problem. Not only will this help set realistic expectations for both you and the repair person, but it will help you compare if you call multiple repair companies. Calling to speak with an appliance professional before they visit your home will also help you to get an idea of the professionalism and demeanor of the repair person —after all, you’ll want someone helpful and friendly. If you are looking for a reliable appliance repair company in San Francisco’s East Bay Area, contact us at WEPCO Service, Inc. We look forward to offering you affordable, quality appliance repair service. Major home appliances are what allow modern households to enjoy the luxuries and conveniences life has to offer. While some appliances are used more regularly than others, they all afford our families the convenience we have grown accustomed to. When an appliance is not working or is not working properly, everyone notices! The expense of replacing an appliance is not something that most people enjoy. However, at some point, it becomes necessary. Here are some tips on how to determine if appliance repair is a viable route or if you should consider replacing your home appliance. One of the top deciding factors in the appliance repair versus appliance replacement debate is how old the appliance is. If the appliance is nearing the end of its lifespan, making an informed decision from there will likely depend on the price of repair versus the price of a new appliance. Check this list of average home appliance lifespans to see if your major home appliance is worth repairing. It is important to note that brand of appliance, how well it has been maintained, and how frequently it is used will affect these averages ages. For more specific information, contact your appliance manufacturer or your trusted local appliance repair company. If the appliance is still within its warranty, contact the warranty company directly first to have any repair or replacement conducted through the manufacturer or retailer first. If your home appliance is on the newer end of its life, most times it is more cost effective to have a professional repair it. If you are considering buying new, be sure to include the “hidden” costs of a new appliance in your decision. Hidden costs are those beyond the price tag listed on the new appliance and include things like new hoses, electrical wiring, and installing gas lines. Not all new appliances will have hidden costs, but it is important to add these to the initial cost when budgeting. One thing to keep in mind if you have an older home or haven’t purchased a new appliance in around 10 years is that appliances have gotten bigger and may not fit the space your old appliance inhabited. If this is the case, you may have to modify cabinets, counters, and doors. To help you decide whether or not your home appliance is repairable and whether or not it is worth it, request a diagnosis from a local repair appliance company. Then, you can make an informed decision and compare prices to get your money’s worth. For a local appliance repair and installation company in the East San Francisco Bay Area including Concord, Pleasant Hill, Walnut Creek, and Danville counties, trust the professionals at WEPCO Appliance Professionals. Contact us for your obligation-free estimate today.